Bourbon Hot Dogs are a wonderful tasty appetizer. Borbon hot dogs work well with Little Smokies too! This recipe for Borbon hot dogs came from Larry Ordorph. Pueblo, CO. 1978. This is one we always make bourbon hot dogs at Christmas. I think this sauce would be perfect for a meat sauce. Very simple, and very tasty. This does well with frozen meatballs as well. This recipe can be used for hot dogs, or even small sausages. The longer the hot dogs and sauce cook together the better this tastes. These bourbon hot dogs are always a party hit. Mix all of the liquids together in a pan, and heat at a medium heat. 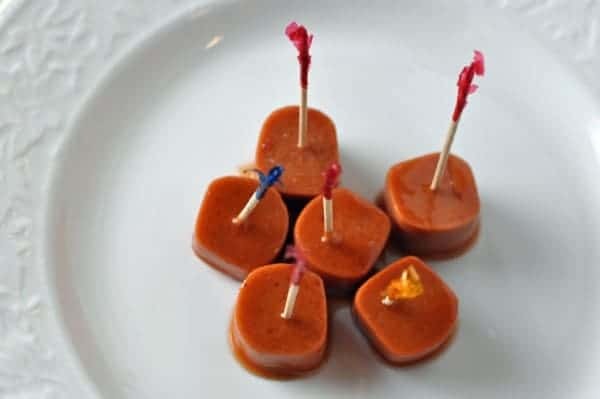 Cut hot dogs into bite size pieces and place in with the liquids. The longer you let this simmer the better. Is there any reason why you can’t use Jack Daniels? Just wondering because that’s what I have here. Thanks!